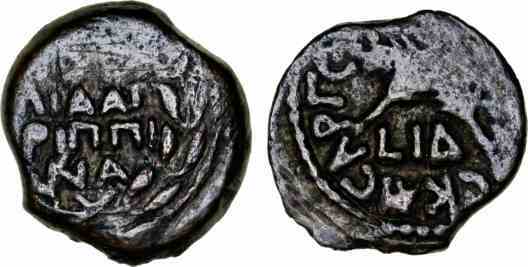 Bronze prutah, 17mm, 2.63gm, issued AD 54. Obv: IOYΛIA AΓPIΠΠINA, Legend within wreath. Rev: [TI KΛAYΔIO]C KAICAP ΓE[PM], Two palm branches crossed, LIΔ beneath. Antonius Felix was the brother of the freedman Pallas and married three client Queens in his lifetime. Year 14 (=AD 54).